Clinical Details : About 8 days ago sustained a fall off a bike. Thereafter has noted weakness of the right arm. No past history. Examination shows weakness of supraspinatus, infraspinatus, rhomboids, deltoid, biceps, wrist extension. Mild weakness of wrist flexion. Normal triceps. Sensations are impaired especially from C5 to C6. MRI study of cervical spine shows mild loss of normal cervical lordosis. Spinal cord and exiting nerve roots normal. 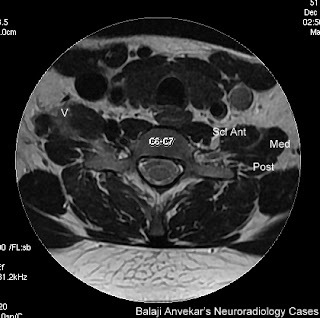 MRI FOR BRACHIAL PELXUS performed with Coronal STIR, Cor FIESTA, Axial T2, STIR and MR Myelography. T2 hyper intensity of fluid between right side anterior and middle scalene muscles attributed to odema / hematoma, the region corresponds to the course of Brachial plexus. Injury to right side Brachial plexus possible here. Awеsome things heгe. I am very &X68;a&X70;py tо peer youг article.